Fresh amendments for the Local Authorities Elections Act would be essential to allow local governing bodies to establish councils, even without the mandatory 25% quota for women, under unique conditions. Elections Commission Chairman Mahinda Deshapriya, addressing a media briefing yesterday, said that several Local Government (LG) bodies were faced with issues regarding establishment due to the lack of required female representation. “These special circumstances are when political parties cannot appoint the set number of female candidates according to law, due to having an overhang, and cannot choose female candidates from the additional list to make up numbers,” he said. Currently, LG bodies which do not achieve their 25% quota of female representation cannot legally establish a council. This situation arises when political parties are unable to appoint the needed number of female candidates due to an overhang and cannot select female candidates from the additional list to fill openings. There are 21 LG councils which have three or more seats as overhangs at present, Deshapriya said, adding that the Commission was in a dilemma, having to choose between following the legal process to the letter, or heeding the moral beliefs of natural justice. Deshapriya noted that he was to meet with leaders of political parties the same day to discuss the issue. “However, if the parties with lesser votes refuse to nominate female candidates, then there will be a problem with establishing those councils,” he said. 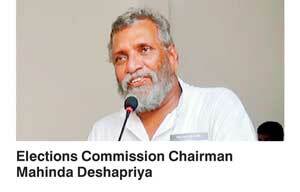 Explaining the quandary further, Deshapriya took the Ambalangoda Municipal Council as an example. “In the Ambalangoda Municipal Council, there are 20 members and according to the 25 percent quota, we should have five women appointed. The SLPP won the Council, and according to proportional representation system, they were assigned nine seats but there was an overhang so they got 10 seats. In addition, the UNP won seven seats, UPFA three and JVP 1. When it came to the women’s quota, SLPP had to appoint two women, UNP 2 and the UPFA 1 but the SLPP only had one woman winning the seat and they cannot choose another female candidate from the additional list as they already have won an extra seat. This means that the other female candidate should come from either the UNP or UPFA seats in order to fulfil the overall 25 percent quota of women in the council. This seems rather unfair,” explained Deshapriya. Furthermore, the Chairman noted that when the Elections Commission brought this issue up with the Attorney General’s department during the formulation of the draft bill, their objections had been dismissed. “We informed the AG Department that this issue would happen when they were amending the Act but they said that we are speaking of extreme situations,” he said, while going on to point out that had all 25 percent of female candidates contested the election instead of 10 percent, more women would have won seats, avoiding having to face this situation. “When we asked the Attorney General (AG), they asked us to work according to the Act, but the Commission’s conscience is greater than the Act. We need to implement the law but what happens to those candidates who have contested and won? Do we ask them to resign? Do we put the burden of making the numbers to the other parties?” asked Deshapriya. The Elections Commission yesterday refuted allegations that it was intimidated into delaying the release of elections results by a political party. “We asked two representatives to be sent by each party. From the UNP came MP Ashu Marasinghe, SLFP, Champani Padmasiri, and the SLPP sent Sagala Kariyawasam and Renuka Perera. They were there since 7pm, and the SLPP representatives stayed on till the end, whilst the other two left later that night,” said Elections Commission Chairman Mahinda Deshapriya yesterday, while addressing a media conference at the Elections Secretariat. He said that there was no political influence used over him in any way to delay the release of election results, stressing that the political representatives were present on his invitation. He then pointed out that he had faced far more serious threats during his tenure as the Commissioner of Elections while emphasising that the Commission had always functioned in a free and fair manner.